GORHAM — It’s Friday night and the courts at the corner of Acorn Street and Gray Road buzz with activity. 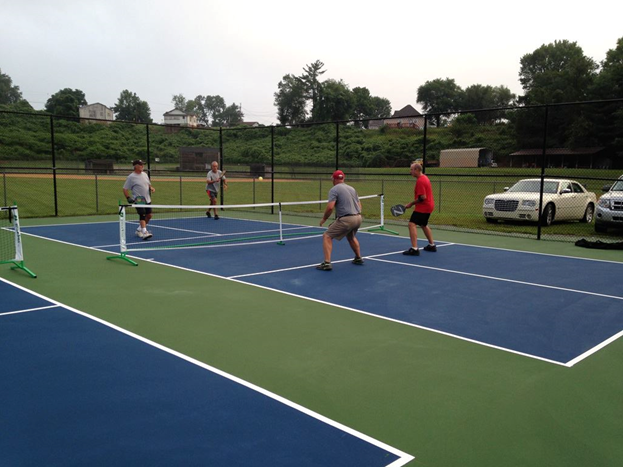 Seven men and five women are split into three groups of four, each playing doubles pickleball inside a chainlink fence that once housed a single tennis court. It’s an upbeat group and an upbeat game, played amid a cacophony of perforated plastic balls being thwacked by composite paddles. But not everyone is thrilled about the game’s growing popularity. In some communities, tennis players are finding they have to compete with pickleball players for space on local courts. Hazelton oversaw the installation last week of six permanent pickleball net posts at the town’s Little Falls Activity Center, resulting in Maine’s first courts devoted exclusively to pickleball. A short walk down the road, at the Little Falls Recreation Area, two tennis courts have freshly-painted red lines for pickleball. Gorham will host the Maine Senior Games pickleball tournaments Saturday (men’s and women’s doubles) and Sunday (singles and mixed doubles) with more than 100 participants. Last year’s Senior Games pickleball event, which took place indoors at the South Portland Recreation Center, drew 119 players, up from 73 in 2013. By contrast, the Senior Games tennis tournament fell from 53 players three years ago to 17 in 2013 and 16 last year. Only a handful have registered for this year’s event, scheduled for early September. “We’re a month away, so it’s still early,” said Jo Dill, who directs the Games through the Southern Maine Agency on Aging. “People are playing tennis, but I think more people are playing pickleball. The court’s smaller and there’s a lot of net playing. A couple of people say my knees don’t take to tennis anymore but I can still play pickleball. To some of those who remain devoted to tennis, pickleball is an invasive species taking over prime recreational real estate. Already this year, pickleball lines have gone down on tennis courts in Bath, York and Cape Elizabeth. Tennis courts in Scarborough and Portland got similar treatment last year. “When they put the (pickleball) lines on, it was a little disconcerting,” said Paul Robinson of Cape Elizabeth, warming up for a tennis match Friday morning on one of two pond-side courts inside Fort Williams Park. His wife and doubles partner, Karen Robinson, said noise from pickleball matches – both from the plastic ball and the usually vocal and enthusiastic players – can be distracting to those playing tennis. Indeed, said Dorothy Stack, another Cape Elizabeth resident who has played tennis regularly at Fort Williams for 20 years and last month found herself alongside two games of pickleball on the adjacent tennis court. At age 59, Stack said she understands she’s approaching the pickleball demographic. It looks like fun and she may join others, like Paul Robinson, who wield both a racquet and a paddle. But not yet Roger Rioux, 67, of Cape Elizabeth went to the Fort Williams Advisory Commission in May for permission to paint pickleball lines on the two tennis courts (there’s also an upper tennis court in a different, narrower enclosure that includes a basketball court) inside the 90-acre park. On Tuesday and Thursday mornings, Rioux puts up four portable nets for pickleball.